When I was working on this DIY acrylic memo board in my Instagram stories, I was getting so much love for how it turned out. 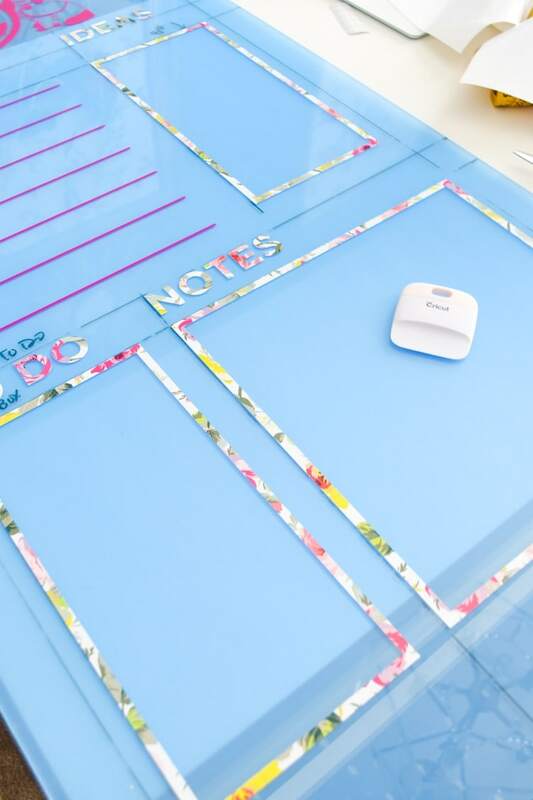 Today I’m providing you all with a full tutorial on how to DIY your very own lucite memo board. 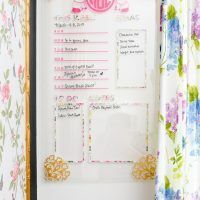 These types of memo boards can be EXPENSIVE, so this is a perfect DIY project to achieve the luxe for a lot less using a Cricut Maker, vinyl, some craft supplies and an acrylic stand off or floating frame. I happened to have an extra acrylic floating frame from Art to Frames that they provided for me to use in my guest bedroom makeover. Due to electrical wires, I couldn’t use it in there, but truthfully I think it worked out better in my office for this project. Here’s a smaller scale example acrylic floating frame of theirs that I used to hold our wifi password. I love how affordable their floating frames are, and there are a ton of sizes to choose from. I had a narrow spot to the left of my windows where my 20″ x 40″ frame fit perfectly. Custom sizes are also available on the Art to Frames website, so if you have an odd size, you can definitely have it custom made. This applies to their floating frames as well as all the other types of custom photo frames they offer. 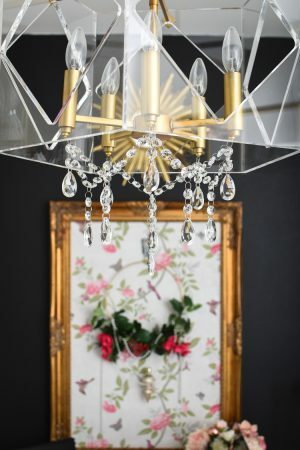 I chose an acrylic floating frame with gold stand-offs to match all the various finishes in my home office makeover. I love how the gold complements the finish on my DIY chinoiserie wallpaper panels. Once I got my Cricut Maker and some vinyl, I knew that this floating frame was destined to be a DIY acrylic memo board. 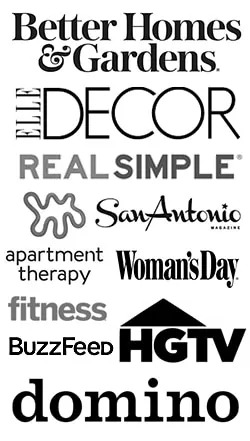 The Cricut Maker can do a lot, but as of right now I’m obsessed with vinyl home decor projects. I made some DIY chinoiserie napkins and love those, but this project may be my new fave. I’ll be totally upfront and state this was a meticulous, time consuming project that required a lot of planning to get it right, BUT the outcome was worth the time investment. 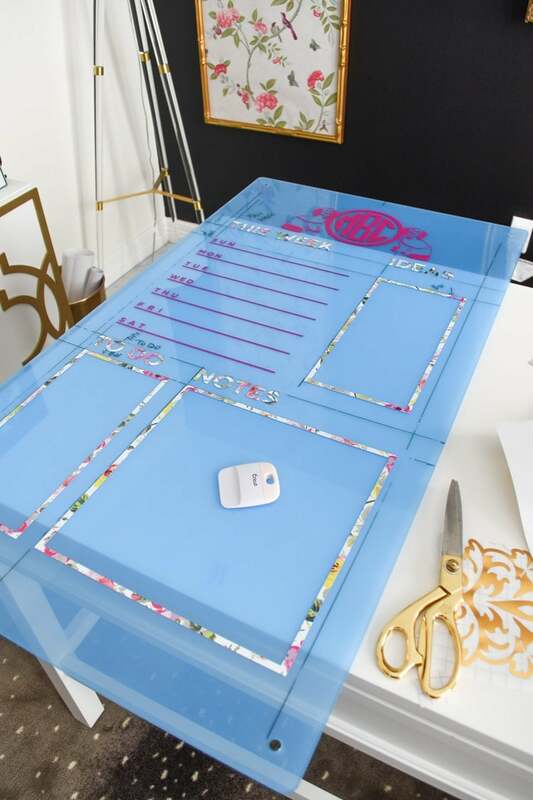 Make a gorgeous, custom acrylic (lucite) memo board using your Cricut maker and the vinyl of your choice in this fun DIY home office decor tutorial. NOTE: The acrylic floating frame I am using has TWO panels (a front panel and back panel). I placed the memo board vinyl design on the FRONT of the BACK panel (so that I am writing on a smooth surface without the possibility of ruining the vinyl). The gold corner accents are on the BACK of the FRONT panel to add some dimension. This means I end up writing on the FRONT of the FRONT PANEL. There's nothing placed on the back of the back/second panel. Hope that all makes sense. 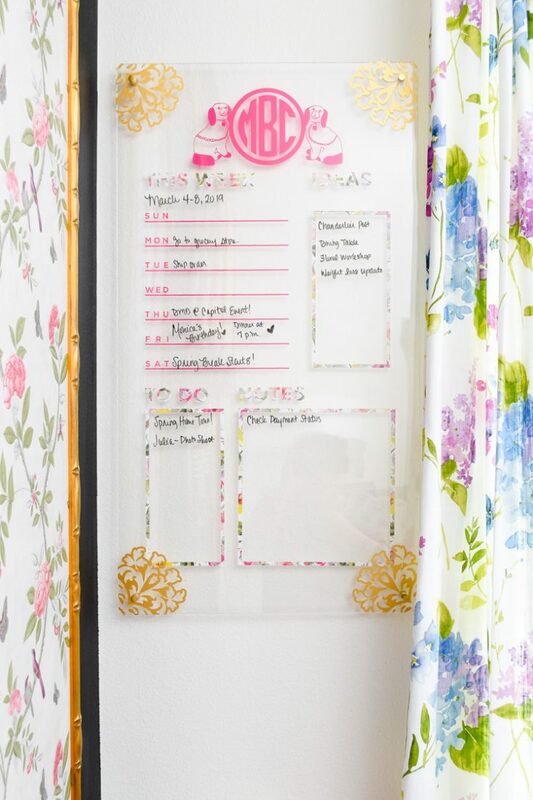 IF your floating frame only has one panel, I recommend you mirror your design and place it on the BACK side to have a smooth writing surface. 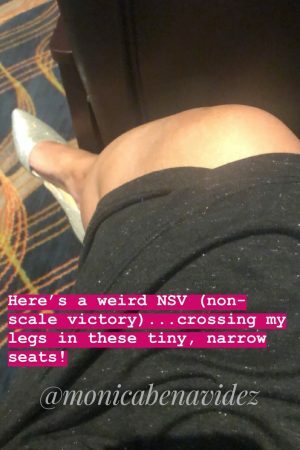 Given that my floating frame has stand-offs, the first order of business was to measure the actual area between the stand-offs that I had to work with. This gave me the measurements I needed to stick to in Cricut Design Space. From there, I decided how I wanted my memo board to flow. I didn't want to overwhelm my board with an entire month of stuff (I have a desk calendar for that), so I opted for a week format followed by several sections to organize my reminders, thoughts and ideas. I laid it all out in Cricut Design Space, but obviously my Cricut Maker can only cut up to 12"x12". (Well, there are longer mats that can push it to 12"x24", but all I have is the 12"x12" currently). This meant I had to divide my various memo board sections into different mats, which was perfect because I was using three different vinyls for this project. Color coding everything in Cricut Design Space really helps when you're trying to take a LARGE design and make it fit the vinyl/mat you're using. 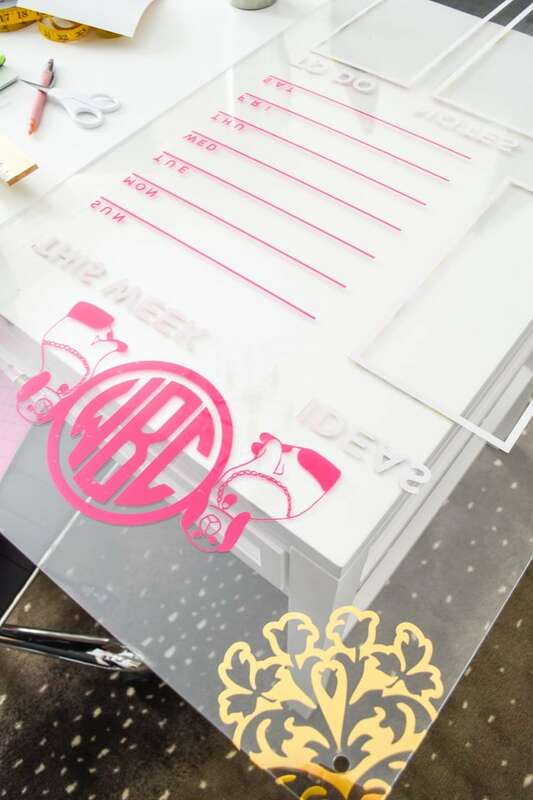 I decided on the pink vinyl for the week calendar and the monogram at the top (which is an adorable cut file I bought from Etsy and added my monogram to). For my headings and boxes, I used the floral vinyl. And for the corner accents, I used the gold adhesive foil in matte. 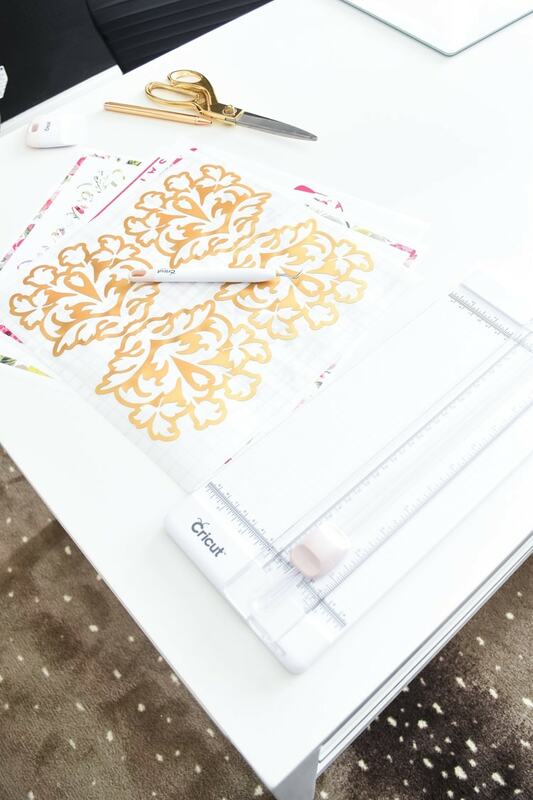 Once I got my large design divvied up into individual mats, I had my Cricut Maker cut away. 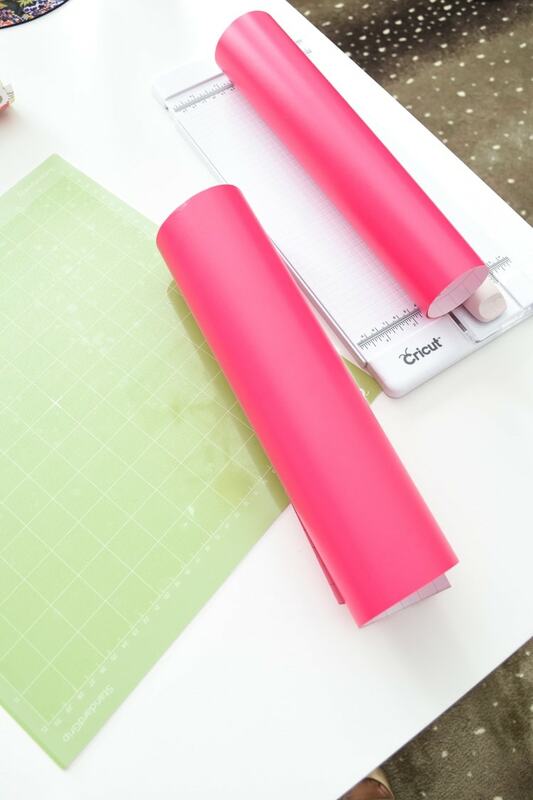 For vinyl that comes in a roll (versus a sheet), I highly recommend using the Cricut paper trimmer to get nice straight edges for your mat. The built-in settings when you choose your material for cutting have not once failed me, and I am still mesmerized by what a breeze this all is compared to my previous Silhouette. After my vinyl designs were all cut, came the weeding process to remove the parts of the vinyl that I wouldn't be transferring over. Now, since I needed to transfer the vinyl to the acrylic floating frame, using transfer tape was in order. I cut the transfer tape down to the size of the design I was transferring and used my scraper to make sure it all transferred over to the tape. Now, let's prep our acrylic panel. Remove any protective layer, if needed. I left the blue plastic wrap on the back to prevent scratches as I worked. I used a yardstick to make straight lines on my acrylic frame panels and notations of where the vinyl designs needed to go. 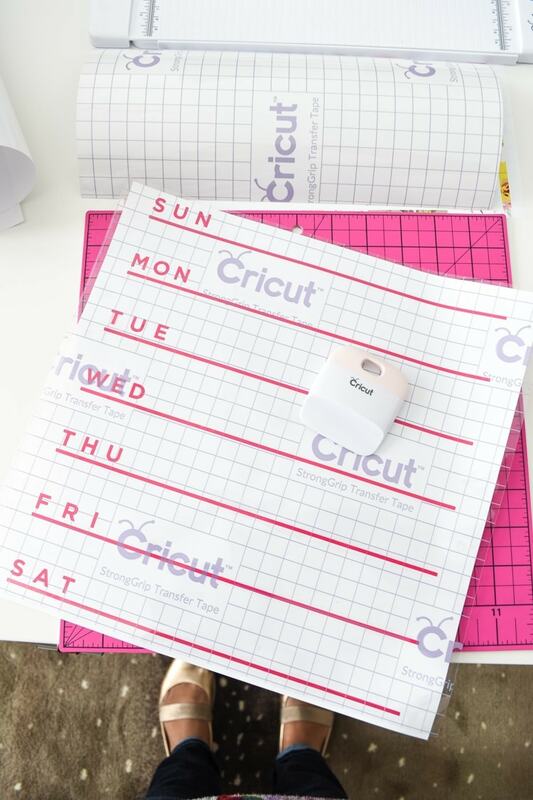 You may be wondering how I knew where to mark- this is where your file in the Cricut Design Space can be helpful. I noted how far down the design was in relation to the size of the board. I knew the top of my headers were 9" below the edge and so on. From there, you can now peel the backing off the vinyl and you have a giant sticker ready to place on your board. The transfer tape is very, very strong, so truthfully you only have one shot to get it placed right. I focused very hard on making sure the vinyl was placed straight and in the right place. I recommend taking your time and not rushing this process. Once you have the transfer tape on the panel, GENTLY use the scraper to make sure the vinyl has all transferred over before lifting the tape off. Repeat until you are done transferring over all the vinyl. Erase all your guides and marvel at what you accomplished.I then also added some gold flourishes to the corners to add some interest and glam. The last step is peeling off all the protective wrap, cleaning all the panels with some dry erase solution (especially the back panel where there will likely be fingerprints) and get it hung on the wall. See my note before the tutorial for important information about the acrylic floating frame I used. About halfway through this project I felt really overwhelmed because I wanted it to be absolutely perfect, but I think the overall look and function totally were worth it. The gold flourishes at the corners were a last minute addition that popped into my head once I realized the corners were going to be pretty bare. I love the slight dimension they add. I have plenty of space for notes, reminders and important tasks I need to accomplish for the week. 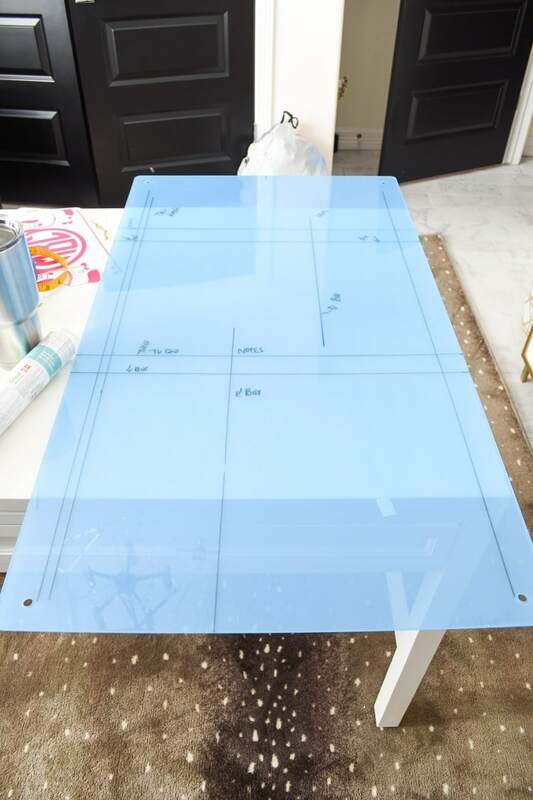 If you plan to DIY one of these, I suggest getting as big of an acrylic floating frame as you can accommodate in your home so that it makes a big impact AND so you don’t have to write super small. Ok, last photo, I promise. I know this tutorial may seem like a lot, but basically if you plan it all out before hand, it’ll all come together. Have questions? Drop them in the comments or shoot me an email. Tomorrow is my birthday, so I’m spending the day doing all of my favorite things. xo! Have a terrific birthday, Monica. My favorite project! 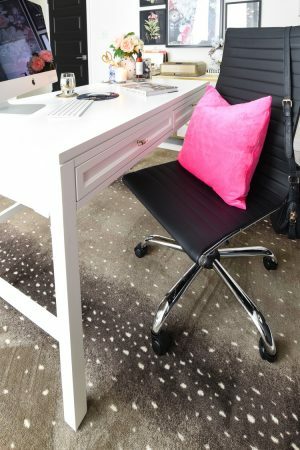 It’s the perfect addition to your office. Wishing you a happy birthday!